Our Austin private dining rooms are perfect for whatever special event you’re hosting. Below is a list of rooms and a brief summary of their attributes. A unique space for your special event! The Cactus Room maintains the same industrialized nineteenth century decor of the restaurant. This provides you and your guests privacy but still maintains the feel of being on downtown 6th street with its warm decor & private bar. This room seats 90 guests and can accommodate up to 120 guests for cocktail style functions. Microphone, DVD player, large flat screen TV, dedicated staff and white linen table cloths are included. Side entrance. A casual setting perfect for smaller cocktail style events. This area is semi-private, overlooks the main dining room and accommodates up to 40 guests seated. A cocktail server is included for the convenience of your guests. Enjoy Sixth Street from above! 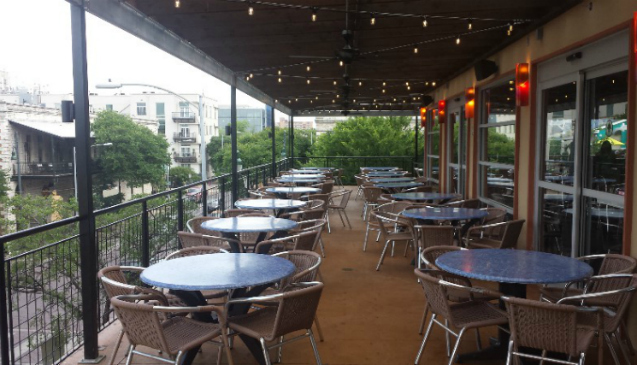 Our Rooftop Patio has the best view of Sixth Street available. This area can be semi-private or private. Enjoy the cool misters during the summer months or heaters when it cools off! A very casual scene with loads of Austin style. Accommodations for up to 200 guests are available. Host a three level event with accommodations for up to 500 guests! Nothing beats the atmosphere of downtown with live music. Be creative and theme each level for a spectacular night of food, entertainment and drink. Book your private dining event today! In Austin Private Dining Rooms. Bookmark the permalink. If you think about it, there’s always a party to be planned. Whether it’s an engagement party, rehearsal dinner, a family reunion or an office holiday party, the Iron Cactus has all the private dining rooms Austin could possibly need. Conveniently located in the heart of downtown Austin’s historic Sixth Street, the Iron Cactus will provide the perfect location for your private event that allows you to take advantage of the best of downtown Austin’s social scene, while enjoying the exclusivity of your event in one of our luxurious private dining rooms, Austin. Our Cactus Room can accommodate up to 120 of your guests in your own personal oasis, while still maintaining that Sixth Street feel. Plus the Cactus Room gives you the exclusivity of your own private bar for you and your guests only. Another favorite option among the private dining rooms Austin loves so much is the Rooftop Patio at Iron Cactus. When what you seek is a relaxed social experience overlooking the downtown scene, our Rooftop Patio is the choice for you. The space lends itself well to a casual affair with loads of Austin style. We can seat 150 guests for a rooftop event, or accommodate 250 guests for a cocktail affair. And don’t fear the elements! When Austin warms up, Iron Cactus is prepared with cool misting fans, and when it gets chilly, we’ll warm your body with our comforting heaters (and a comforting meal!). Regardless of the size of your private event, know that here at Iron Cactus we have private dining rooms Austin guests will fall in love with. 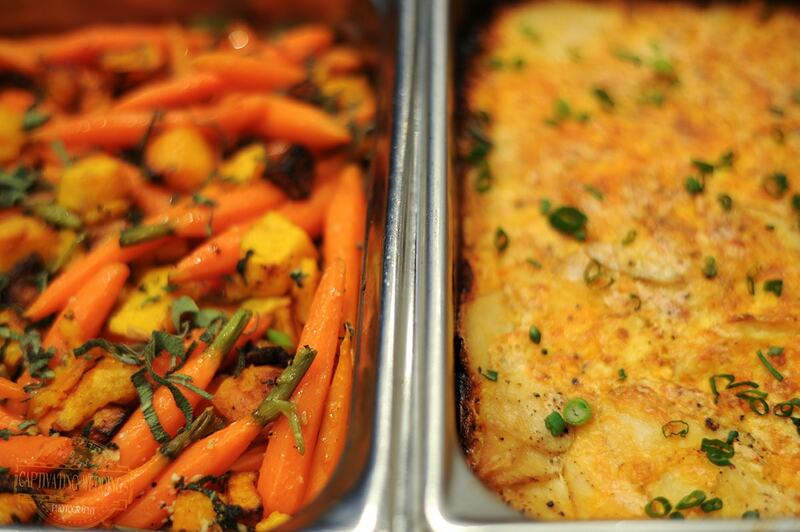 So whether your event is for twenty people or for 2000 guests, we look forward to helping you with all of your needs. If you’re ready to book your party now, you can do so at https://ironcactus.com/in-house-party-request/. 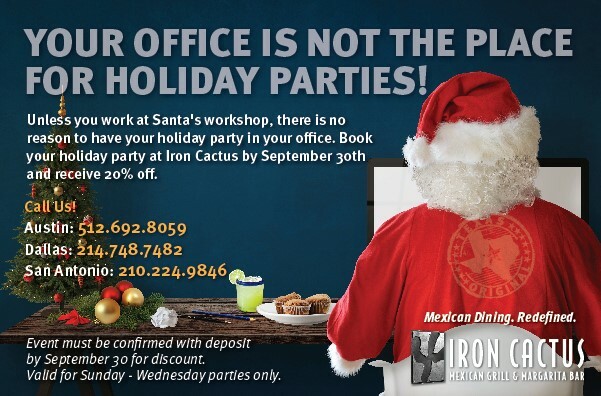 For more information, contact us at 512.472.9240 or find us online at www.ironcactus.com. When you’re looking for private dining rooms for parties, lots of things come to mind: patios, drink menus, inside party rooms, outside party spaces, private rooms, open spaces, food choices, buffets or off-the-menu…the list goes on and on. With Iron Cactus Mexican restaurants, we can service just about any need you may have for private dining rooms for parties. We cover that entire list of needs with one group of restaurants. When you think of throwing a party, and we mean a party, if you’re in Dallas then our Tapas and Margarita Bar could be the perfect space for a party. It is on the second level of our restaurant, and features a half-moon Tapas (appetizer) bar for show cooking. Watching our chefs create delicious tapas just adds to that party environment. The bar extends into a circle to include a full bar, a wall filled with tequila choices, a margarita machine (of course), and our amazing bar menu of inventive cocktails. The Tapas and Margarita Bar work well in conjunction with the Cactus Room, where you move to for your dining experience for groups of up to 150 people. The second floor can also be used in a full buy-out situation for large events, including a dining patio looking out on Pegasus Plaza in downtown Dallas. 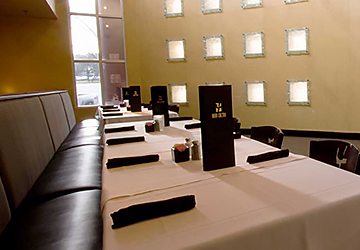 For private dining rooms for parties in Austin, you have many choices with our 2 Austin restaurants. If you’re having a party where you want privacy, especially in a full dining situation, the Cactus Room at our Stonelake location definitely fits that need. The room is completely enclosed, and accommodates up to 40 seated guests or 50 guests at a cocktail style event. San Antonio is synonymous with the word “party.” Even though our location is right on the Riverwalk, it does have a wealth of options to host a private party in one of our dining rooms. Our Agave Room is a unique space for your event, including an open tapas grill and a private bar. This can be a private room for up to 90 seated guests for dining. It also includes a small stage, projector, screen, and other features for a presentation or corporate event. Also in San Antonio, for an alternative to the private dining situation, you could take your party on a tequila dinner cruise on the river. It includes a private tour of the San Antonio River Walk with your own boat and captain, all while enjoying fine Mexican dining and tequila cocktails. 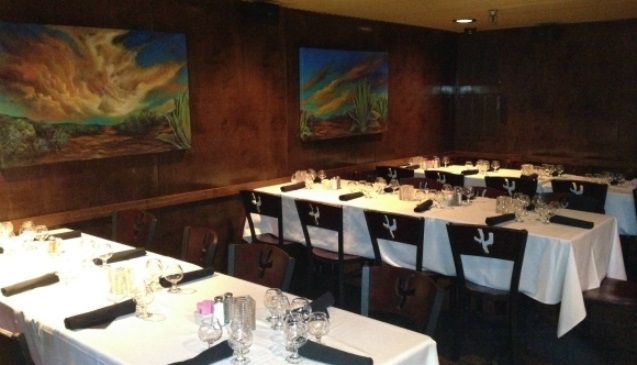 If you’re looking for private dining rooms for parties, Iron Cactus Mexican Restaurants have you covered. In Austin downtown at 6th Street and Trinity and in the Arboretum area at Stonelake and 360, in downtown Dallas at 1520 Main Street, and in San Antonio on the Riverwalk at 200 River Walk. In Austin Private Dining Rooms, San Antonio Riverwalk Private Dining Rooms, Private Dining Rooms, Dallas Private Dining Rooms. Bookmark the permalink. Wedding season is upon us and Iron Cactus Mexican Restaurants offer the best private dining rooms available in Texas. Are you looking for the perfect private dining room to host your wedding reception or rehearsal dinner? Planning a spring or summer wedding? Take a look at each of our amazing locations and what they can offer for your special day. In San Antonio, Iron Cactus Mexican Restaurant is the jewel of the Riverwalk. Located across from the rustic La Mansion hotel, our private patio is a great place to relax. Watch the boats go by with the family and let us give you a Mexican dining experience you’ll never forget. Our Agave Room at Iron Cactus Mexican Restaurant in San Antonio features an open tapas grill and is home to its own bar. The Agave Room in San Antonio can accommodate up to 90 seated guests or up to 125 guests for cocktail-style functions. In Dallas, we offer one of downtown’s most breathtaking views and spaces. Iron Cactus Mexican Restaurant in Dallas houses 14,000 square feet and 3 stories of amazing views and private dining spaces. Our spectacular roof top bar provides unforgettable views of downtown Dallas and Pegasus Plaza. Iron Cactus Mexican Restaurant offers two great Austin locations with private dining rooms for your next event. In Downtown Austin we present the flagship of our company featuring our famous rooftop patio and three floors of fantastic dining spaces. From hosting a 3-level event with accommodations for up to 500 guests to cocktail style functions of 120, nothing beats the atmosphere of downtown Austin. Sit on the patio and listen to the music coming up from the street! In North Austin we offer elegant dining spaces that represent the modern-chic style of North Austin, on Stonelake Boulevard in the Arboretum area. Our Agave Room offers a large open space that radiates out from our curved bar and boasts marble tables and suspended blue lighting. The small agave side sits next to the patio and accommodates up to 50 guests, while the large agave side accommodates up to 100 guests. The Cactus Room is a completely enclosed private dining room, a rarity in North Austin, and is great for private dinners, lunches, and corporate meetings. This room accommodates up to 40 guests seated or up to 50 guests for cocktail style functions. If you’re looking for private dining rooms for your next event, Iron Cactus Mexican Restaurants have you covered. Learn more about each of our locations at www.ironcactus.com. In Austin Private Dining Rooms, San Antonio Riverwalk Private Dining Rooms, Dallas Private Dining Rooms. Bookmark the permalink. It can be difficult finding the perfect Austin, Dallas and San Antonio private dining rooms when planning an event. Are you planning an event or gathering in 2017? Iron Cactus Mexican restaurant is the perfect place to host your private party, event, or gathering. Since there are Austin, Dallas and San Antonio private dining rooms, you don’t have to travel far to find the right location for your party. Iron Cactus offers the best private dining rooms and the best food to go with it. If you’re planning a wedding, bridal shower, baby shower, bachelor party, birthday party, corporate meeting, or just a family gathering…we have the space to take your entire group. At Iron Cactus in Downtown Austin, you can host an event on all three levels of our Mexican restaurant that can host up to 500 people. How about a cocktail party for 120 people? No matter the size of your event, Iron Cactus Austin private dining rooms are the perfect place to be and is sure to please anyone who attends. If you’re looking for a space in North Austin, Iron Cactus is happy to provide you with our “Cactus” Room. The Cactus Room, one of Austin private dining rooms, is completely enclosed, a rarity in North Austin, and great for private dinners, lunches, and corporate meetings. This room accommodates up to 40 guests seated or up to 50 guests for cocktail style functions. 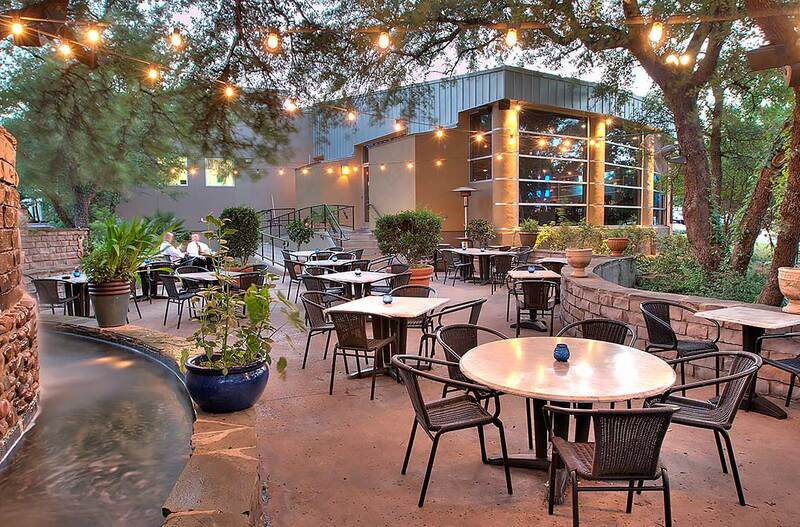 Our Outdoor Patio is the best of any other North Austin Mexican Restaurant! Shaded by trees and accented with a large wall fountain, our outdoor patio is the perfect area to enjoy beautiful Austin weather. This area can be semi-private or be used a private dining room. Accommodations for up to 70 guests seated or 100 cocktail style are available. The Loft is located off the main dining room, the loft’s high ceilings and natural light are just right for your small gatherings. This semi-private room accommodates up to 24 guests seated. At Iron Cactus in Dallas, we have over 14,000 square feet of Dallas private dining rooms space on three floors overlooking the famous Pegasus Plaza available for your event. Enjoy fantastic views of downtown Dallas from our rooftop patio. In San Antonio, you must check out our Agave Room right on the Riverwalk. Part of Iron Cactus’ San Antonio private dining rooms, this space can accommodate up to 90 seated guests or up to 125 guests for cocktail-style functions. Our Patio is located right on the river. This area can be semi-private or private. It is separated from the pedestrian walk way by a lovely garden. Enjoy the sights and sounds of the Riverwalk at this open-air patio. The patio can accommodate up to 85 seated guests or 120 cocktail style. The upper dining room can accommodate 40 guests comfortably for a seated dinner or 60 guests cocktail style. 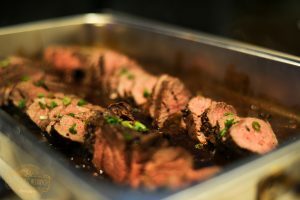 The next time you are looking for Austin, Dallas and San Antonio private dining rooms for your event, big or small, be sure to check out Iron Cactus in Austin, North Austin, Dallas, and San Antonio. 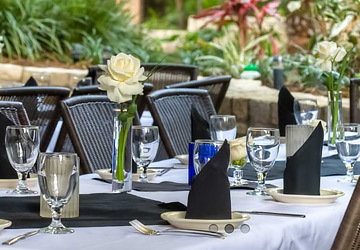 In Austin Private Dining Rooms, San Antonio Riverwalk Private Dining Rooms, Dallas Private Dining Rooms Tagged Austin Dallas San Antonio Private Dining Rooms Bookmark the permalink. Regardless of the size of your party, or the reason for your celebration, the Austin Dallas San Antonio private dining rooms at Iron Cactus Mexican restaurants are perfect for your event. Whether you are in Dallas, Austin or San Antonio, we’ve got you covered. Austin Dallas San Antonio private dining rooms offer variety and come in all shapes and sizes. North Austin at Stonelake has four different options for party rooms. Our Agave Room is a large open space radiating from our curved bar and includes a large stage in the center. This is perfect for a ‘happening’ company party, or most any event, and can fit parties of 50 to 150 guests. Our Cactus Room is a completely enclosed room great for private dinners, lunches and corporate meetings, accommodating up to 50 guests. The Loft is a small area off the main private dining room for a small gathering. And of course, you can host an amazing outside party on our patio for up to 100 guests. Downtown Austin at 6th Street and Trinity has four options for Austin private dining rooms and private parties. 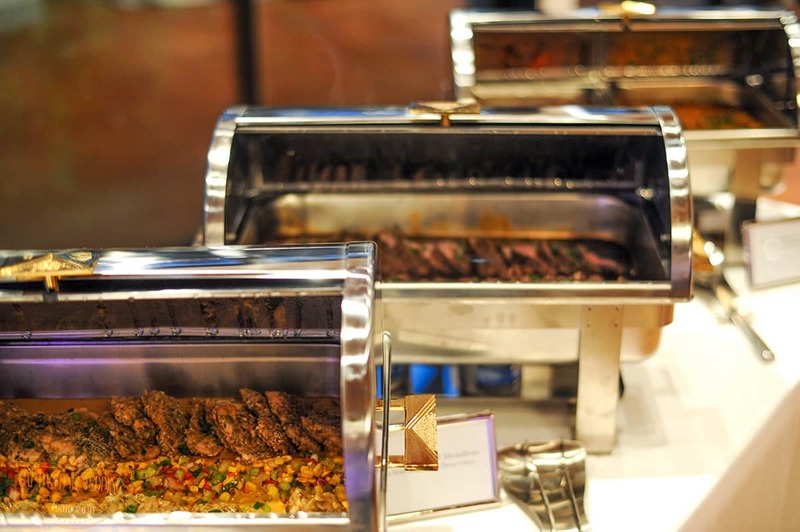 If it’s a big corporate event, rent the entire restaurant accommodating up to 500 people! Or pick the best roof top patio in Austin, right above 6th Street, for a party of up to 250 in a cocktail setting. You can also choose the Cactus Room, a unique space including a private bar fitting up to 120 guests. Or finally, throw a casual get together in our Mezzanine for up to 40 guests. 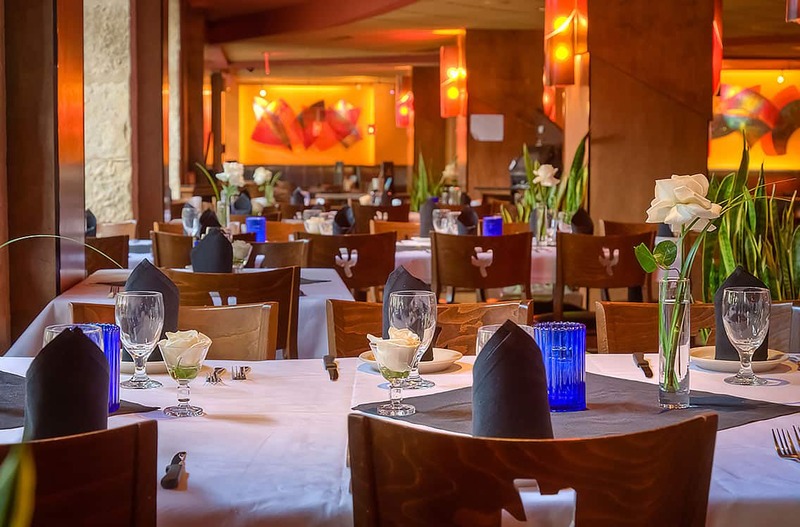 On the River Walk in San Antonio, Iron Cactus features 5 San Antonio private dining rooms or party spaces, starting with the entire restaurant for large events of up to 500 guests. The Upper Dining Room option features floor to ceiling windows looking out onto the Riverwalk, and can accommodate 40 to 60 depending upon whether it is for a cocktail event or sit down dinner. The Patio is right on the Riverwalk, and can very casually be set for 85 to 120 people. Finally, a unique party option is to take a Tequila Dinner Cruise, enjoying fine Mexican cuisine and of course, tequila, on the river itself. Last but not least, our Downtown Dallas Iron Cactus is an amazing venue that will turn heads at your next corporate event or private party. Our Dallas private dining rooms include the Cactus Room, including a birds-eye view of Main Street and room for parties of up to 110 guests. The Tapas and Margarita Bar is a sophisticated spot on the second floor featuring a Tapas bar for show cooking entertainment, plus a full bar, tequila wall and margarita machines, fitting parties up to 150. The Plaza Dining room opens onto Pegasus plaza for dinner parties of 70 and cocktail receptions up to 125. Move the party outside on the patio and plaza for groups of up to 2,000 people – so your closest friends and family only! Or rent the entire 3-level restaurant for up to 500 guests. 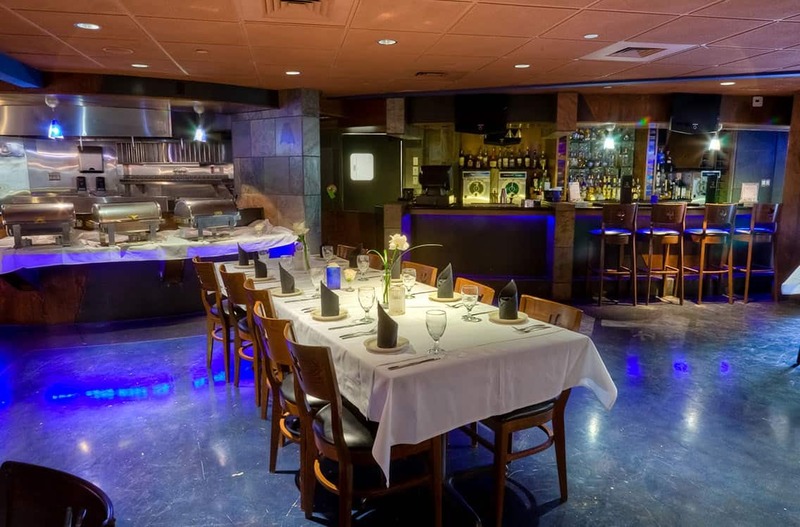 Regardless of the size of your group, or your need to gather, the Austin, Dallas and San Antonio private dining rooms at Iron Cactus Mexican Grill and Margarita Bar are always a hit. YOUR OFFICE IS NOT THE PLACE FOR HOLIDAY PARTIES! Unless you work at Santa’s workshop, there is no reason to have your holiday parties in your office. Book your holiday party by September 30th and receive 20 percent off. The season of giving begins at Iron Cactus. We will give you 20 percent off when you book your holiday party by September 30th. Call now to reserve a wonderful venue to celebrate the holiday season! Event must be confirmed with deposit by September 30 for discount. Valid for Sunday – Wednesday parties only.